It's no wonder that Stockholm touts itself as “beauty on the water.” After all, this Scandinavian capital was built on 14 islands where Lake Malaren flows into the Baltic Sea. And the city lies adjacent to an archipelago made up of more than 24,000 islands, islets, and other rocky formations. One-third water, one-third greenbelt, and one-third city area, this city with a natural equilibrium was founded in 1252, and has been Sweden's capital since 1436. Many of us know about this city which home to the Nobel Prize, as well as the famed annual jazz festival and perennial smorgasbord, but there's even more to discover in Stockholm. This is a contemporary, trendy, and sophisticated city, yet Stockholm beckons in part because of its small-town feel. 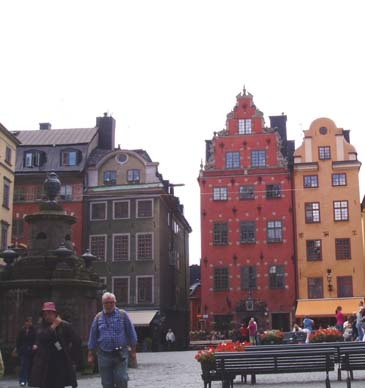 A good place to start a visit to Stockholm is in The Old Town or Gamla Stan, a compact, pedestrian-friendly island of cobblestone streets and colorful historic buildings. Here, the Royal Palace stands as a testament to Sweden's historic position of great power in the 17th and early 18th centuries. Completed in 1754, the Royal Palace has several areas open to the public: the Hall of State; Royal Chapel; Gustavus III's Antique Museum; the Treasury with the Royal Regalia and other jewels; and the Royal Armory. The Honour Guard has been positioned at the palace since 1523. If you're near the courtyard around noon, pause for the changing of the guard. Meander the narrow streets of Old Town, and browse the boutiques, antique stores and local handicraft shops. 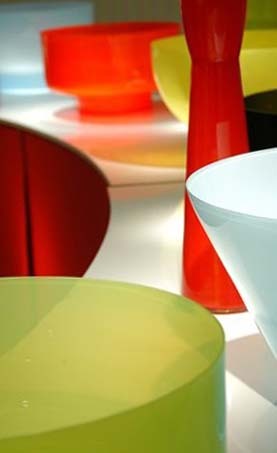 Sweden is known for its sleek and innovative designs, while its crystal and glass art are legendary. Some stores and art galleries such as Nordiska Kristall offer glassblowing demonstrations. along the way, do try one of the restaurants or outdoor cafes where sipping coffee is a national pastime. 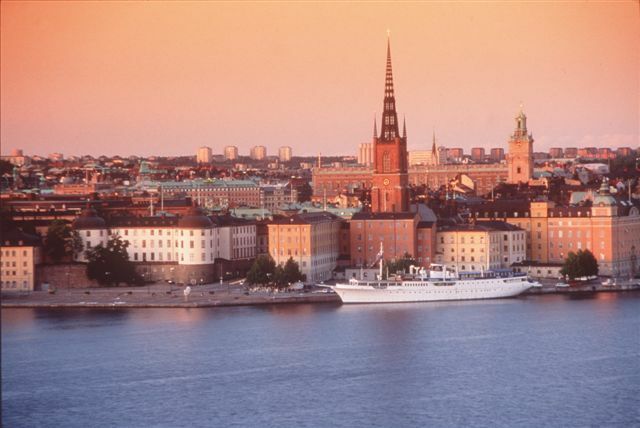 Stockholm boasts 100 art galleries and 70 museums. You can learn about past laureates at the Nobel Museum, temporarily located at the Stock Exchange building in the heart of Old Town. The Nobel prizes have been awarded in Stockholm since their inception in 1901. Inventor and industrialist Alfred Nobel stipulated in his will that the interest of his fortune should be distributed annually to those who have done the greatest good for mankind in the fields of chemistry, literature, medicine, peace, and physics. Also visit the stunning Blue Hall in City Hall where the exclusive Nobel banquet takes place. You can sample past menus at the Stadshuskallaren restaurant in City Hall. A must-see is the amazing Vasa Museum built around the royal warship Vasa. Intended for a major role in the Swedish navy, the Vasa embarked on her maiden voyage in 1628, but unfortunately she capsized and sank in the harbor. Attempts to raise the ship failed. Most of the Vasa’s 64 guns were raised in 1664, but it wasn't until 1953 that Anders Franzen began his search for the ship. He located the Vasa three years later, and after much exploration and digging, the Vasa was lifted out of the deep after 333 years. Incredibly, the ship was largely intact. Originally, the ornate Vasa took three years to build and featured hundreds of gilded and painted sculptures. Its hull is constructed from 1000 oak trees. Some say the Vasa’s enormous size and masts, and heavy guns contributed to the sinking. Opened in 1990, the Vasa Museum occupies the site of the former naval dockyard. When you take a break from sightseeing, stop in Stockholm's “coolest” bar — the Icebar at the Nordic Hotel. This is definitely a bar experience out of the ordinary. You're given a thick, hooded parka and gloves before you go in. Step up to the ice bar, and order a beverage (even orange juice) that is served in ice glasses. Yes, the glasses really are made out of ice — hence the need for the gloves. Now it's time for the quintessential Swedish smorgasbord at the historic Grand Hotel's Veranda. You're even given a list of seven tips on how to best enjoy the feast! 1. Think of the Swedish smorgasbord as a four-to six-course meal. 2. Do not overload your plate. Make several trips to the buffet instead and take a fresh plate each time. 3. Begin with the herring dishes traditionally accompanied with hot potatoes. Then try a slice of sharp Swedish cheese, crisp bread and a shot of aquavit with cold Scandinavian beer. 4. Next, sample the fish dishes, and try the Swedish specialty gravlax (marinated salmon), and don't forget the mustard sauce with dill. Try the smoked eel and salmon with a squeeze of lemon. 5. Then we suggest a variety of salads, egg dishes and cold cuts of meat and poultry. 6. Now take your pick of the hot dishes — and remember to take lingonberries with your homemade meatballs. 7. And finally, enjoy one of our famous desserts — the fruit salad is always delicious. Why not complete the smorgasbord by having a strong cup of coffee together with chilled traditional Swedish digestif punsch? A trek to Lapland and the Arctic Circle is within your reach from Stockholm. It's only an hour's flight (via a 737, not a small commuter plane) to the charming and friendly town of Lulea, the gateway to Lapland. The shallow Lulea archipelago of 700 islands is at the top of the Gulf of Bothnia, which lies between Sweden and Finland. With a wide pedestrian-only street, downtown Lulea is an excellent place to find specially-made handcrafts from local and regional artisans. Perhaps you'd like to sample the local delicacies of bleak roe and reindeer meat. Or not. 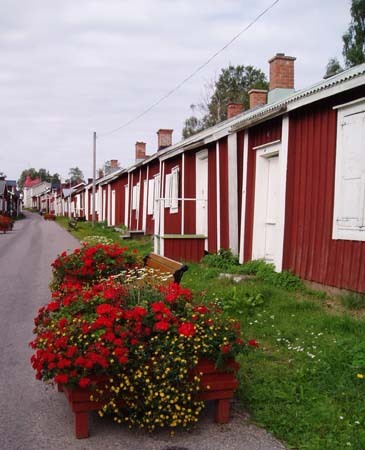 During the summertime, Lulea offers visitors the most hours of daylight. In fact, it barely gets dark. If you're a golfer, you can play 24 hours a day at Rutvik, the most northerly 27-hole course in Sweden. A short distance away, the World Heritage Site of Gammelstad Church Town remains a remarkable example of the traditional church town of Northern Scandinavia. 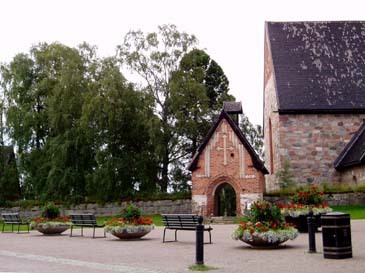 Of Sweden’s original 71 church towns, only 16 are left today. Gammelstad is the largest and best preserved with 408 cottages and the stone church, which was built in 1492. Farmers and their families converged here to attend mass, court sessions and parish meetings. It also afforded them the opportunity to meet people from other villages, so “courting sessions” were not uncommon. The church town tradition lives on, and a few times a year parishioners are invited for a church weekend. Less than two hours from Lulea, you'll cross the Arctic Circle into Lapland. 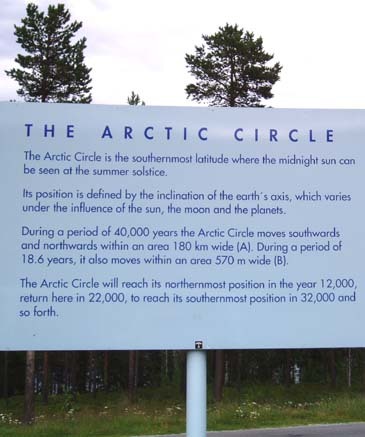 It can be rather exhilarating to stand underneath the gigantic sign marking the official Arctic Circle. By the way, the region of Lapland encompasses the far north part of Norway, Sweden, Finland, and Russia. The indigenous people of Lapland are the Sami, who were traditionally reindeer-herding nomads. Today the Sami’s economy is based on reindeer farming, fishing, hunting, and handicrafts. 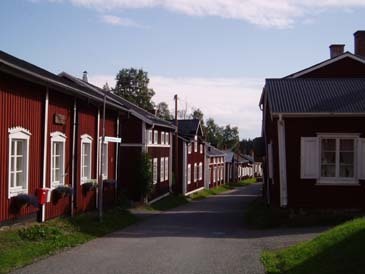 Not far from the Arctic Circle, the town of Jokkmokk pays homage to the native people with the Sami Museum. The comprehensive museum takes visitors through exhibit areas that are devoted to every detail of Sami life — from the early settlers to elaborate costumes that are still worn today. The annual market in Jokkmokk, which has been in operation for more than 400 years, still draws people in to gather around, chat, buy, and sell. Even today, in this setting of old traditions, deals are made with a firm handshake. Market time is quite chilly, but the folks are warm and welcoming. For more information, see www.lulea.se and www.swedishlapland.com. To access a PDF copy of the Stockholm Visitor's Guide, CLICK HERE. To view the city, CLICK HERE. To view digital movies of the city, CLICK HERE. Stockholm as a Business and Convention City? CLICK HERE or CLICK HERE. The Stockholm Card or Stockholmskortet gives you free admission to 70 museums and attractions, free travel within the city, free city sightseeing by boat, special discounts and more. You can buy this card at the Tourist Centre in the Sweden House.